Another couple of firsts for me in canning this year. While I've done pickled beets before, I have never canned beets plain. Now that I have my pressure canner, I can do so. I canned 9 pints of beets and then the next day opened a pint to make beet hummus. Very tasty! Then I dug up yet more carrots from my garden and used those to make a carrot cake jam recipe that I found in a book from the library. The house smelled so amazing when the carrot cake jam was bubbling. It has spices in it as well as coconut, pineapple and pear. Really fantastic on an English muffin with cream cheese. If I get enough carrots, I may try to do another batch of the carrot cake jam. I think they would make good gifts. 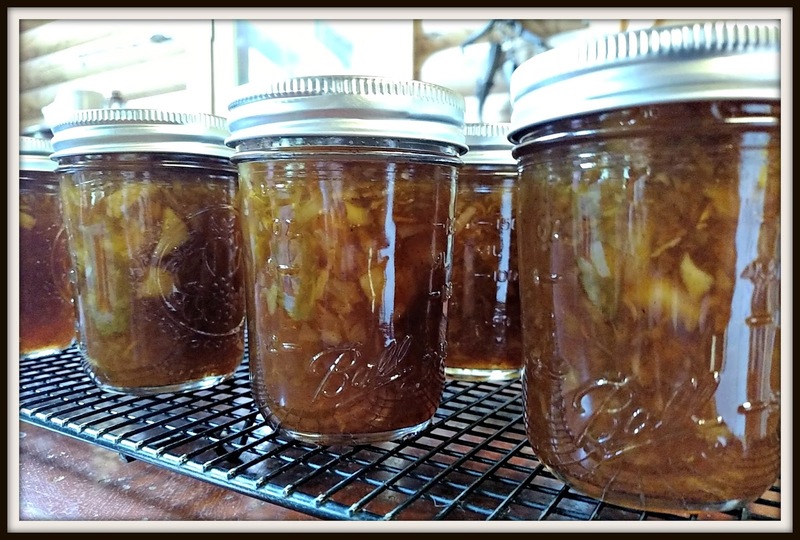 Readers, have you done any preserving lately? What wonderful delights to enjoy this winter. I fondly remember grandma canning beets. Your jam sounds unique and very delicious. It would make hostess gifts, teacher gifts, etc. 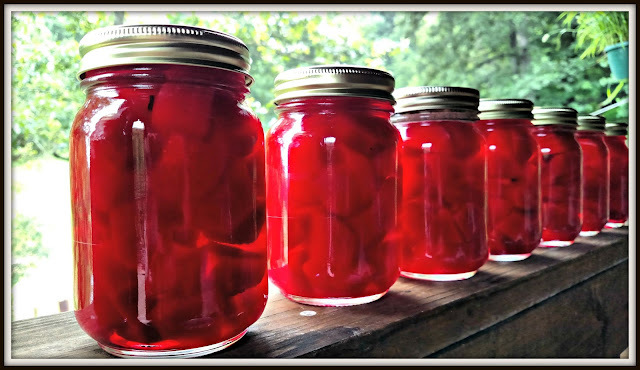 Your adventures in canning are teaching me about foods I've never heard of. I love hummus --does beet hummus have chickpeas in it? And the carrot cake jam sounds delicious--does it have nuts like carrot cake? Looks good! I have green beans ready to can but I need to get a load of wood while it is cool. Carrot cake jam sounds like winter treat. My beets are still in the growth stage so it will be a while before any are ready to can but I hope to have a few jars as they are great for a quick vegetable when you just don't want to cook something. Lovely photo of those beets, and that jam sounds delicious although I have never heard of it before. I also never knew that carrots could be turned into jam, so thanks for giving me another snippet of info! Carrot cake jam sounds delicious! You find the best things! I have never canned in my life, but my friends do. Phil says the fence is more awesome than ever, now that he knows how it is attached to the ground. He was very impressed. Thanks! Carrot cake jam? Now that's something I need to look into. It sounds delicious! We're waiting for more tomatoes to ripen up. Travis has been processing them, and freezing them. In the fall we'll make a few days dedicated to canning. I have not done any canning in a few years - the excuse? Lazy. Have never heard of Carrot cake jam!! That looks divine! - If you make more and want to sell a few jars, I'll buy and pay shipping. I'm so impressed. I love that you can things. Wish I lived nearby so I could try some!! That's awesome, Lisa! I bet the carrot cake jam is out of this world. I canned tomatoes this year as well as made peach and plum jam. I hope to can string beans next year. I love beets. Those look really delicious. I started to learn how to can things once, but never followed up. Our county has a canning plant for everyone to use, so I can't even plead the expense of buying the equipment. But our little garden experiment went fairly well overall this year. So next year we may plant a much larger garden and then I would have something to can. Wow!! You canning is so pretty! You've been a busy bee with canning! I've never heard of carrot cake jam. Sounds yummy. That's wonderful. You'll have a little taste of summer all winter. unjelled jam is good over ice cream. also reheat the jelly with chia seeds. it will jell. store in fridge. I'm truly impressed! I've never canned anything, but my mom is currently making a bunch of flavored honey for the winter. No, only times I tried canning, the results were not very good.